Volume envelope swells and quick stabs with adjustable Attack and Decay times: 4ms to 8s. • Mono mode: a single volume envelope for the full signal present at the INPUT or RETURN jacks, the envelope resets when you pluck a new note. • Poly mode: gives each note you play its own envelope, as seen on the EHX HOG2. • Built-in, fully adjustable, Harmonix fuzz enhances the volume envelope effect and produces bowed instrument sounds. • Built-in effects loop allows for your own pedals to be inserted before the volume envelopes. 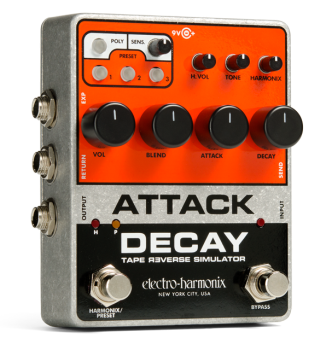 • Expression pedal or CV control over every knob on the Attack Decay. • Continuous Envelopes turns Attack Decay into a retriggable Tremolo. • Save and recall up to three presets. • High quality analog buffered bypass. • Comes supplied with EHX 96DC-200 power supply.